In "Blue Valentine," writer-director Derek Cianfrance sends doppelganger Ryan Gosling to do battle with Michelle Williams in an epic fight to save a flagging marriage. Dean (Gosling) is one of those guys who can play any instrument, sing, draw… artistic pursuits come effortlessly to him. And yet all he wants to do is paint houses, drink beer, and be a father and husband. He exists in an ambition-free state that is endemic to his generation, one which allows him to make a sacrifice for Cindy (Williams) that cannot be repaid, just to be with her. Cindy is a doting granddaughter who hopes to someday study medicine, the type of person compassionate enough to spend a day in a wheelchair simply to better understand what that life is like. But she wants more than the life she has with Dean and their daughter Frankie. The frustration slowly turns her into an uncommunicative and insufferable beast furious about the debt she feels. The similarities in appearance and mannerism between Gosling's character and Cianfrance are impossible to ignore. But lest you think Cianfrance a misogynist, pay attention, Dean is not easy to live with: he lights a cigarette so he doesn’t have to talk to his oxygen-tank-toting father-in-law, he teaches his daughter to eat raisins off the kitchen table… You get the idea. And Cindy is very much the other half of Cianfrance’s tortured psyche—Dean Cindy, Derek Cianfrance--get it? Cindy seeks order, pays the bills, has ambitions… she’s a grown-up. The chemistry between Gosling and Williams is as good as you would expect from two such talented actors. Williams in particular should be commended for giving her all to a character that is extremely unsympathetic. The preparation that Cianfrance put them through clearly paid dividends. "We shot three weeks first, for the past. Then we took a month off. And then we shot the present day for another three weeks," Cianfrance explained following a screening at Sundance earlier this year. "I think that time we spent in the middle there was really key, because we had a house and Ryan, Michelle and Faith, who plays Frankie (the couple's young daughter), we all kinda just lived in that house. We gave them a home video camera, we had a Christmas tree in the garage and they just kinda celebrated their life in there -- they lit the Christmas tree, wrapped Christmas presents, made birthday cakes, cooked chicken soup. (It was a) fully functional house... Ryan and Michelle did a lot of dishes in the house to prepare. The anger, of which there is no shortage, the moments of joy, all work." 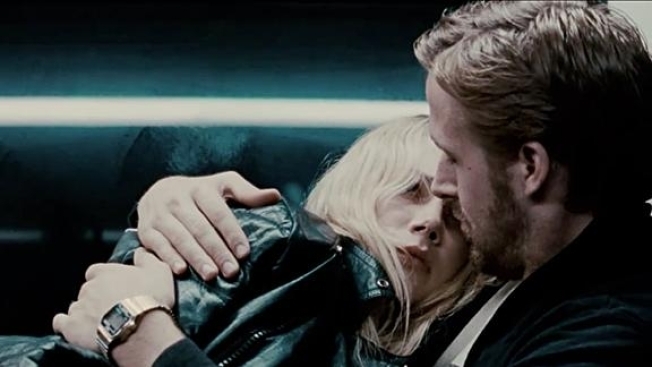 Part of what makes "Blue Valentine" work, too, is Cianfrance not intruding too much on the action. Either from over a shoulder, through a window or from the backseat of a car, we're observers to the drama unfolding. Often, we don't even hear what's being said, but it's not important, the body language tells the story. Cianfrance color-codes his characters to heartbreaking effect, the reds and blues giving you clues as to how the relationship is faring, and he shot the past and present in different formats, giving the former a sepia-tinged graininess of old memories. “Blue Valentine” is a great film and maybe the worst date movie of the century.